Using captcha is a way of stopping spam over running your site forms and comments. There are different types of captcha out there from distorted text to picutres to video. Here is an interview with an interesting captcha idea that uses images to find out if the form data is entered from a human. webdevelog: Could you tell us a little about what CAPTCHA is? Confidenttechnologies: A CAPTCHA is a security test used on websites to stop automated computer programs (called bots) from registering fraudulent accounts, spreading spam, or posting links to unsafe websites. Typically, CAPTCHA tests show warped and distorted words that are supposed to be impossible for computers to read, but that people should be able to read. In this way, CAPTCHA tests can distinguish between legitimate, human visitors to the website and bots. webdevelog: Why is this not the best way? Confidenttechnologies: The problem is that in order to be more secure against bots, CAPTCHAs have become so distorted and difficult that people can’t read them. Website visitors become very frustrated and they often abandon the action they were attempting or they abandon the website completely. Bots are also able to break these text-based CAPTCHAs by using optical character recognition (OCR) software. So, CAPTCHAs showing warped and distorted text have become too frustrating for people and they are not even very secure against bots. webdevelog: What makes Confident a better solution? Most people find it much easier to use than being forced to decipher warped and distorted words. At the same time, it’s more secure against bot attacks because bots aren’t able to intelligently identify the subject of the pictures. webdevelog: What is the future of CAPTCHA? 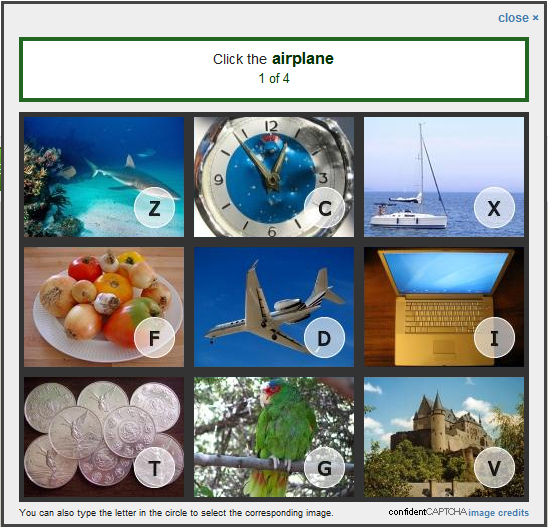 In the future, there may even be an opportunity for website owners to earn revenue by allowing some sponsored ad images to be included in the Confident CAPTCHA image grid. webdevelog: Thank, where can people find more information about Confident CAPTCHA? Confidenttechnologies: It’s free to use for most websites, so check it out at www.ConfidentTechnologies.com or get the WordPress plugin at http://wordpress.org/extend/plugins/wp-confident-captcha/. webdevelog: Thank you for telling us about Confident Teachnologies and using CAPTCHA. That is one way of solving the spam problem, if anyone has used this technology or other then please comment below on how you found it. You can follow any responses to this article through the RSS 2.0 feed. You can leave a response, or trackback from your own site. I have used the captcha and have indeed found it to be hard to read sometimes, and I do NOT like to try it again. I have not seen confident yet, but I can see how it is a better solution against a bot. Thanks for posting the link and bringing this to light.